Fred Gmitter examines a variety of citrus in his lab at the Citrus Research and Education Center in Lake Alfred. Oranges, grapefruit, tangerines and limes. Most people think of these as signature plants of Florida, but scientists have traced their origins back millions of years and across continental land masses, said Fred Gmitter, a University of Florida Institute of Food and Agricultural Sciences (UF/IFAS) professor of horticultural sciences. 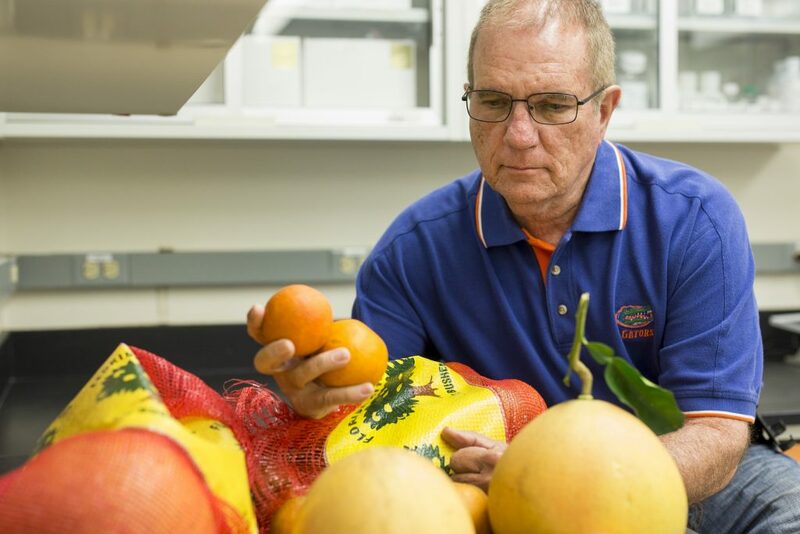 Scientists can describe the evolutionary paths of your favorite citrus, from prehistoric times until now, said Gmitter, who will serve as the keynote speaker as the UF/IFAS Citrus Research and Education Center (CREC) celebrates its 100th anniversary on Nov. 29. Gmitter will serve as one of the speakers as CREC celebrates its 100-year anniversary at the facility at 700 Experiment Station Road, Lake Alfred, Florida. Others who will speak include Kent Fuchs, UF president; Jack Payne, UF senior vice president for agriculture and natural resources, and Michael Rogers, CREC director. Activities are scheduled to begin at 9 a.m. and run through 3:30 p.m. with lunch included. To register for the commemorative ceremony and afternoon field trips, click on https://crec100years.eventbrite.com or call 863-956-8632. The day will include trips to CREC’s laboratories and fields where UF/IFAS scientists work on solutions to Florida’s citrus issues. Those researchers include Nian Wang, UF/IFAS associate professor of microbiology and cell science, who will talk to the public about his work on genetically editing citrus to make for more disease-resistant cultivars. People also can listen to Gmitter and Jude Grosser, a professor of horticultural sciences, speak about how they use genetics to breed the best citrus cultivars and rootstocks. Participants can also taste samples of some of the finest citrus UF/IFAS has to offer, Gmitter said. Kirsten Stelinski, a UF/IFAS associate professor of entomology, will introduce participants to the world of the Asian citrus psyllid, which can transmit the deadly citrus greening disease. She and her research team also will inject psyllids to show how to manipulate their bacteria. Entomology associate professor Lukasz Stelinski plans to hold an open house in his lab that will showcase his recent work. He, too, will focus on managing the Asian citrus psyllid, which can transmit the greening disease to citrus trees, possibly killing them. Arnold Schumann, a UF/IFAS professor of soil and water sciences, will guide a tour in which guests will visit the 1-acre citrus under protective screen (CUPS) research facility. The facility is designed to grow high-quality, disease-free, fresh fruit by excluding psyllids, citrus greening and other pests and diseases, Schumann said. Weather permitting, Schumann also will demonstrate a robotic drone sprayer used in the CUPS. But due to quarantine protocols, visitors will not be taken inside the CUPS.